You might be thinking "I already subscribe to Ember Weekly, what's different about this one?" Ember Weekly, which is run by some amazing community members and friends (👊 @owz) focuses mainly on highlighting community-created content like blog posts, videos, events, from the perspective of Ember.js users. 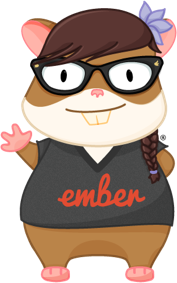 The Ember.js Times, on the other hand, is run by the official Ember.js Learning Team and aims to provide an inside look into the development of the Ember.js ecosystem, straight for the hors^H^H^Hamster's mouth. We will be checking out commits, meeting minutes, analysing RFCs, and more. I, @locks, will be your scribe for this issue, but keep an eye peeled for appearances from other team members! You might also be thinking, "didn't I subscribe at TinyLetter? why am I getting an email from Goodbits?" The short answer is we moved! We announced the newsletter prematurely and while setting everything up, realized that Goodbits would be a better fit. Come with us now, and journey through time and space to the world of Ember.js. This week I'd like to start by talking about issue triaging. For a while now, shout out to @pixelhandler, there has been a group of people that helped out the Core Team by triaging issues in the ember.js issues tracker. Unfortunately, due to the lack of granularity of GitHub permissions, these people were not able to label or close issues. That's why an informal issue triage team has been recently created, and wow have they been busy! With over 200 issues closed in the last month, only 24 unlabeled issues remaining, and much feedback given, the team is well on their path to make sure contributions are addressed early. Join us at #dev-issue-triage in the Slack community, and help keep the train running smoothly. Don't worry if you're a newbie, come by and someone will guide you! If you peek into the commits and the pull requests tabs, you'll notice a bunch of commits about globals cleanup. The team is cleaning up the modules internally to make module resolution simpler, which in turn helps the work being done in addonifying Ember, and Glimmer. Speaking of Glimmer, it's coming along speedily, in part thanks to the community response to "The Ultimate Glimmer 2 Test Porting Guide" written by Godfrey Chan. If you're interested in making Glimmer happen sooner than later, head out to https://github.com/emberjs/ember.js/pull/13316. There are still some issues up for claims and remember, if @chancancode, so can you. What about Ember CLI, the command line interface for ambitious web applications? Not to be left behind, they've also been working on several interesting things. The first and most visible one is the one mentioned in the official Ember blog. Additionally, I'd keep an eye on the code stripping RFC, as well as the one about platform support. Onwards to easier, and leaner builds! Our fantastic and much-beloved browser extension for inspecting Ember application is nearing an interesting milestone, v2.0.0! The main change is with regards to the internals. To ease the maintenance burden, and to allow much faster development of new features, the Inspector is going to be split up internally into multiple ones, associated with certain Ember versions. On top of keeping the Guides up to date, especially with the 2.5 release this month, the learning team also has been hard at work improving the tutorial, specifically @toddjordan's effort in creating a Google Maps service tutorial. You might not be familiar with the Ember Hearth project, as it's still gearing up for a stable release. It is a GUI version of Ember CLI, with some sprinkles on top. The second 1.0.0 alpha should be coming up shortly, so keep an eye out on the releases page. The Ember.js website has also gotten some love in the form of making the pages' layout responsive, and adding a new call to action to the homepage. Last but not least, some quick news on Ember Twiddle! On top of a new design starting to come to life, another much-wanted feature is slowly making it way into Twiddle, the ability to use addons! There's already support for some in the canary branch, join #-ember-twiddle on Slack for more details.